The State of K-12 Economic and Financial Education in the U.S.
Only 17 states require a high school course in Personal Finance. And only 22 states require a high school course in Economics. 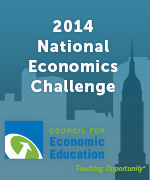 Number of states requiring student testing in economics has dropped from 27 to 16 since 2002. Only five states require a stand-alone course in personal finance for high school graduation. 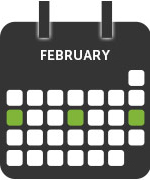 Stay Tuned for all results–publishing February 12, 2014 at https://www.councilforeconed.org/survey. Funding for this survey was provided by Capital One Financial Corporation. 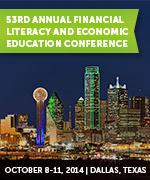 CEE is now accepting proposals for its 53rd Annual Financial Literacy and Economic Education Conference, being held October 8–11 at the Renaissance Dallas Hotel in Dallas, Texas. 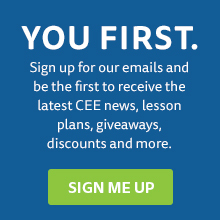 As in past years, the CEE will proudly provide an invaluable opportunity for hundreds of teachers to address current economic and financial topics to enable educators to raise the levels of economic and financial literacy among K–12 students. Click here to submit your proposal. SUBMISSION DEADLINE: Friday, February 14, 2014. Mobile Phones Matter is an informative lesson featured on EconEdLink.org, which includes a variety of free resource links about the use of mobile devices. One resource shares expert tips on creating passwords and another discusses safety concerns over privacy issues before downloading apps. Another resource features a collection of searchable apps for iOS and Android mobile devices. The apps support a range of content areas as well as apps for you to use as a consumer. 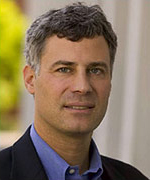 Today, CEE published the first in a series of blog posts featuring a question and answer interview with Alan B. Krueger by two of 2013 Alfred P. Sloan Teaching Champions Awardees, Kathleen Brennan and Saji James. The question and answer interviews cover topical issues including unemployment benefits, increase job growth, minimum wage legislation, investment in human capital, and more. Dr. Krueger, the Bendheim Professor of Economics and Public Affairs at the Wilson School at Princeton University and former chairman of President Obama’s Council of Economic Advisers, is the author of the newly published textbook, Explorations in Economics. Click here to read the first post and follow up on Twitter or Facebook to be alerted when the next installment in the series is published. NY1 TV sent a film crew to Brooklyn Tech for a close look at students playing Gen i Revolution. Check out the video. To learn more or to start playing today, register at www.genirevolution.org. The Calendar of Historical Events provides 365 days-worth of historical facts and interesting developments in personal finance and economics. See what happened on this day in history, and use the related lessons in your classroom. With huge debts owed to the United States after WWI by countries such as England, France, and Italy Congress gets together and rounds the number off to $11.5 billion dollars to be paid over sixty-two years, at two percent interest. Years later even this plan would turn out to be unrealistic. On this date John L. Lewis was born. Lewis’ claim to fame comes as the leader of the influential United Mine Workers Association (UMWA). Rising from the ranks of the Illinois coal mines he started on his forty year struggle for workers’ rights. Former chief of the Federalized Bank of U.S. gets a charter from the state of Pennsylvania to start the bank for a second time under private ownership. It will eventually shut down for a second and final time in 1841. Create a team of students. Compete. Check with your local council for specific dates in your state. Check in which of the two divisions your team should compete, reviewing the 2014 Rules and Eligibility. 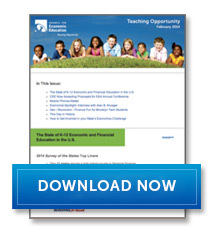 Download the 2014 Teacher Guide, which contains all of the information you need to know about getting your students to the Finals. State Champions advance to Nationals, check the 2014 National Semi-Finals Proctor Instructions.